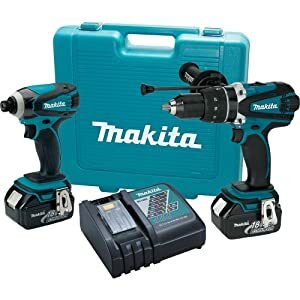 One of the power tools that you can commonly find in garages, repair shops, and construction sites is a cordless drill. It is one device that should be owned by a woodworker, as it has the power to make holes and drive screws into flat, elongated and rectangular timber. Cordless drills are typical representatives of essential tools for people, who enjoy doing projects around the house or small workshops. 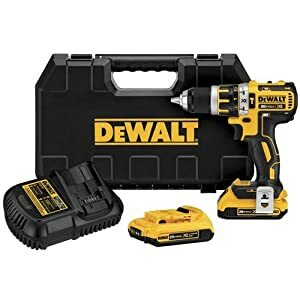 This Dewalt drill model has for its prominent feature a smooth running powerful brushless motor, which gives more time for the tool to do its tasks. The motor has two-speed transmissions and three drive modes. The handle is designed for comfort and efficiency in a working environment; you get a better grip and a comfortable super light feel in your hands. Included in the kit are 2 XR-Li-Ion batteries, a charger, and a carrying case. This Dewalt DCD795D2 can accomplish with ease all the tasks that it professes to do, including going through concrete and masonry. It has a LED light to help you do your job, even in dark spaces. Truly, the superior quality of this tool far outshines its price. This is another cordless drill that has a brushless four-speed motor, as its prominent attribute. Its other features include the fastening control called the Quick-Shift Mode, the Integrated Mode, which makes proper fastening certain. The Assist Mode and the Tightening Mode make sure that the torque and speed of the motor are under control so that no stripping, breakage, and damage will occur to your working materials. Whether you use this drill in a workshop or around the house, this Makita drill model is a necessary tool to own. It is reliable, durable and offers great performance. You do not have to charge it frequently and you can be sure that it can get the job done every time. The package includes a rechargeable battery, a carrying case, impact driver and a battery charger. This is one of those highly priced cordless drills in the market, but the price is justified by all those modes and speeds that are valuable additions to the tool. 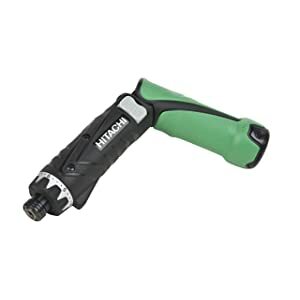 This Hitachi cordless screwdriver uses a dual position handle for maximum versatility. It means that it can change its setting from straight to pistol position, so it can be adapted to many applications. The battery is Lithium-Ion, which has a life that is 3x longer than other batteries for a cordless drill. The chuck, which holds the bit is purposely designed for quick changes of bits. The design overall is compact and lightweight and the built in the LED light allows you to work even in not so bright areas. This Hitachi DB3DL2 cordless drill is suitable to use for lightweight jobs, those that do not require a lot of rotating force. What you will love about this device is that you can get it into difficult to reach spaces, by adjusting the angle to what you need it to adjust. 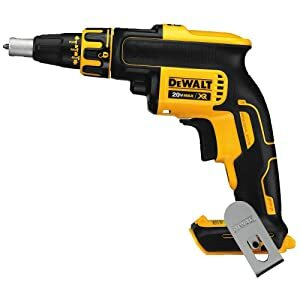 The second Dewalt to make an entry on my list is the DCF620B Max Brushless Screw Gun, which is a special tool designed for use by drywallers. These are construction workers that have skills in installing walls and ceilings in a residential building. This device is also perfect for those who enjoy doing some DIY projects around the home. This tool has 4,400 rpm brushless motor, which offers a maximum runtime amount. It offers a 3-year limited warranty, as well as a year of free repair service. It also gives you a 90-day money back guarantee. How about that? This Dewalt cordless drill though is not suitable to use on a contractor level. It is nice and quiet, making it more appropriate for house jobs. Unfortunately, it has some plastic parts contributing to its lightweight. This Milwaukee right angle drill measures only less than 4” long, making it the most compact drill to find on the market. It features 12 torque settings. It is not a very expensive tool and its quality is suitable for its price. The tool has an LED light and an onboard fuel gauge. The kit contains a carrying bag, long lasting batteries and a dual voltage charger for both the M18 and M12 batteries. Another nice addition is that you are allowed to use an XC extended battery that offers a longer life span, than the other long-running batteries. Some users, however, find it difficult to use in small holes and warn to be careful with the extra thick grip, as it may cause you physical discomfort. 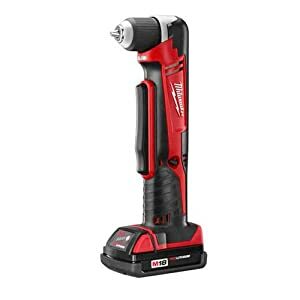 Here is another Milwaukee that is able to get to my list, the M18 2605-20 hammer drill. It is out to make a mark, with its impact energy of 1.8 foot-pounds and a reliable and powerful brushless motor. This tool is an 18v drill and is among the most compact of its kind in the market. It has a Redlink Plus feature that keeps the tool from overheating, overloading and over-discharging. A revolving lock chuck holds the bit securely. The handle is designed to absorb shock and give you a good grip. The Milwaukee M18 2605-20 is a powerful hammer driver and drill driver in one. Loads of torque is able to manage, even the hardest materials. Being cordless, lightweight and compact makes it a very portable tool that you can carry around. It can be adapted to many different functions, is so well balanced. 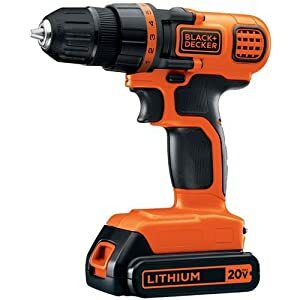 It is very easy to see why the LDX120 is Black & Decker’s best-selling model. You simply look at its design – so light and compact, weighing only 3.4 pounds, you can move it around with ease and no hassle. With this model, you are also able to reach those areas that you thought are impossible to access. The lightweight is less likely to result in extreme tiredness of your arm and hand. While this tool is one of the smallest in the market, it offers a 650 rpm and 115 pounds of torque – a lot of power to do most tasks. One downside of the LDX120 is that it has only one speed; so if you are to drill through brick, concrete and other hard surfaces, you would most likely want a cordless drill that is more powerful than this model. The batteries are quick charging and long lasting. The ergonomic design makes it comfortable to use even for extended hours. There are other brands and models out there that are also great to be included on my list of best cordless drills. However, these 7 are my top picks. I hope you can make a choice from the tools that I reviewed above. To help you further in making a sound decision, here’s a buying guide that hopefully will make you a savvy cordless drill shopper. Whether you’re a hobbyist, a do-it-yourself person or a contractor, you might as well have known that there are a hundred or more brands and models of cordless drills to find in the market. This makes it hard to find the right tool that will suit your wants and needs. Besides mobility that allows you to carry a cordless drill around, there are other factors to consider when looking to buy this tool. In most cordless tool models, the Lithium-Ion (Li-Ion) battery is what you will usually find in the kit and this is a good kind of battery. Some models though, like the older one and other current ones, still use the Nickel-Cadmium (NiCd) battery. While it also performs great, when used frequently in difficult tasks, it is not friendly to the environment. So choose the Li-Ion over the NiCd battery. It is now commonly used in nearly all cordless drills brands and models. Opt to buy the kit that contains two batteries, so you can have an immediate replacement when you find out that the one on the tool is dead and you have work that needs to be completed in a short time. It is also more economical than to buy a battery separately later on. Most inexpensive cordless drills offer only 1 speed. Some models have 2 fixed speeds that give you the ability to switch from lower to higher, depending on the task. For instance, you use the lower speed, when you need to drive screws and the higher speed when you need to drill holes. The high priced cordless drills have variable speed and it is easy to find one that provides 1,000 rpm or more. 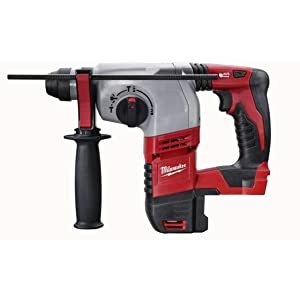 You might feel that the handle design is not a very important feature, but maybe you haven’t tried to use the cordless drill for a long period of time. If you’ve been working hard with the drill for long hours, you might conclude that a good grip and a well-designed handle are features that shouldn’t be overlooked. The T-handle is good because it keeps your hand from slipping when working with the drill. The C-handle, which is also called a pistol grip, is better to use when doing heavy drilling and driving. With this type of handle, you can put more of your weight behind the tool. Choosing the right bits for the task that you need to work on can have a good effect on the outcome of your work. When you’re in the market for a cordless drill, find out if the tool comes with drill bits and everything else that you need. If not, there is no reason to get upset. There are a lot of options to find and they can be used interchangeably on almost all models. The type of the battery and how powerful the tool that you want to buy, dictates the size and weight of your cordless drill. In short, you might have to sacrifice the size and weight of the device, if the power and life of the battery are more important to you. Not so compact drills may be hard for you to reach work areas, as well as you might experience fatigue on your hand, after extended time at work. What is chuck? It is the hole that you find at the end of the cordless drill. This holds the drill bits. Cheaper and smaller drilling tools often have only 10mm chucks, but a 13mm chuck is more ideal if you are looking to work in improvement projects of larger residential buildings. A keyless chuck is also advisable. It allows you to loosen or tighten the chuck using your hands, without worrying about finding the key to it. These days keyless chucks are common in cordless drills. When searching for a good cordless drill to buy, remember this buying guide and you can easily find the tool that you need. You will surely be happy with the purchase because you know for yourself that you picked the most suitable tool for the job at hand. Even if the cordless drills are continuously receiving updates and improvements, there is one product that you will find perfect for your use.